Our preparations for the new cruising season started in earnest once we had seen the New Year in. Scott got busy in the sanitation department moving our guest quarters toilet pump to a new position in the engine room – hopefully making for a quieter toilet experience, so to speak! He also removed a redundant autopilot system ( not Mary!) which has created more storage space in the wheelhouse cupboards – and he also improved the insulation in same cupboards. The boat’s battery system got an overhaul with some improved venting. In February we made the trip to Corpach boatyard for haul-out and antifouling. A check on bearings and replacement of anodes was part of the deal and Scott got a new coat of paint on the hull. Inside, Red Moon has benefitted this year with some new wheelhouse shelving, a tidy up of paintwork and a complete re – varnish of all our floorboards which has given her a bit more of a warm glow! Most recently we have carrying out the annual upkeep of her exterior paintwork and varnishing – dodging the wet weather as usual. We are almost there and she’s looking a lot smarter. So it’s been a period of steady progress and pleasingly seen our bookings calendar filling up nicely which is always very exciting for us. Whilst our first official charter of the year is at Easter, in the Sound of Mull, there is going to be a ‘shakedown / birthday cruise’ with friends the weekend before Easter- a chance for us to get back into the groove of cruising/chartering! There have been one or two lovely days recently and it gives us hope and inspiration for the summer to come…next stop Skye in May! So far we have had a great winter based in the Marina at Dunstaffnage near Oban. We have a rather prettier view here and enjoy looking out to the hills and the wonderful sunsets and sunrises we see. We have done a bit of exploring around the nearby headlands, from which we get stupendous views out towards the Sound of Mull.We hope to get much further afield when time allows. Red Moon is protected for winter with a roof cover, plastic ‘double glazing’ and strong covers over her aft and forward decks. There have been some wild and windy days (one is happening as I write this !) but there have also been many calm and stunning winter days. We have offered cruises this winter with just this kind of day in mind. No takers so far but we are available in January if you want to blow away the cobwebs and start the New Year a little differently! Since October we have been keeping busy with private chef work in various lodges around the Highlands and we hope this venture will grow alongside our summer cruising business. Christmas is here on Red Moon and she looks great with pretty lights up the mast and our little tree up in the wheelhouse. We have been preparing for a trip even further south to see family and friends in Devon for the festive season. The New Year will see us busy cheffing or cruising, or both, and come February we will be preparing Red Moon for the new summer season, starting with a haul out and bottom clean and paint! We are pleased to, so far, have our first booking of the season at Easter – but we are available earlier than this 😁…! Into October and now it was just a case of finding a happy weather window in which to head south to our new winter home near Oban. Or so we thought…..
After some filming on the beach at Kyleakin, the camera crew and Director sped round to Kyle and joined us onboard. We sailed out into the channel and stopped below Maol Castle to start to try and film Matt Baker and Kevin Williams of Skayak Adventures who were already afloat. They decided they needed to get closer so while Mary took the helm and kept Red Moon safely out of the way of other traffic, Scott took the crew onboard Silver Cloud to get some close ups. It was all over pretty quickly and once we had returned to Kyle and re organised Red Moon we departed the Pontoons for our journey south. We spent the night just inside Loch Nevis and departed in the early hours with the promise of a light northerly and a following sea….This never quite materialised so we had a rather lumpy rounding of Ardnamurchan Point, but once safely round, things smoother out and we had a lovely sail all the way to Dunstaffnage Marina – home for the winter. September 2018 was, it has to be said, rather a tempestuous month for everyone after the hazy days of summer with two named storms, Ali & Bronagh sweeping through in one week – that of the Equinox so perhaps not so surprising. We had a full month of bookings however so not to be daunted by the weather we set forth to show our guests as much as we could of this wonderful area. For this cruise we first took them south of the Skye Bridge and down the Kylerhea to Lochs Hourn and Nevis and it was actually in Loch Nevis that he got the shot. We stayed in one spot for sometime watching the otter on a fishing trip….On our way north to Loch Hourn we had a fabulous eagle spotting opportunity. To finish their three night trip we sailed round to Plockton for a little visit ashore spending the final night at anchor behind the Kishorn Islands. Our next guests were well versed in boat life having enjoyed cruises with both the Majestic Line and Argyll Cruising. This time they fancied a trip for just the two of them and that’s where Red Moon comes in just right! As strong winds were predicted we decided to race ahead up the Inner Sound to hide out in Loch Torridon, where there is plenty to explore for a day or so. On day three we peaked our nose out from Loch Torridon, after some impressive eagle spotting on the way and with our staysail set we cut across the waves heading for Arcaseid Mhor on Rona. It was quite bumpy in the Sound but this made for fun conditions for a pod of dolphins we encountered on our journey! Once inside Caol Rona and then the anchorage itself all was calm for a while and we anchored deep in the bay to await the next big blow. Fortunately this timed nicely for Rob & Lynda to be taking a walk ashore and and having a good exploration of this lovely little island. Next day we slowly made our way back into Caol Rona and not liking the look of the sea state to the west we headed east and turned down the coast of Raasay. This was a good move as we had a relaxed cruise south, with an eagle overhead at the start and end and we managed to anchor for lunch by Brochel Castle. Scott took Lynda and Rob ashore and they were able to walk up and take their first steps on Callum’s Road. We spent that night at anchor to the east of the Scalpay narrows so that the next morning we could take advantage of the high tide to sail through the narrows and round to Churchton Bay off Raasay, always a popular place to visit especially with a Distillery to check out! For their last night we had a long cruise back to the Skye Bridge, through Loch Alshe and down to Letterfearn in Loch Duich, passing Eilean Donan castle on our way. Another three night cruise followed this one with guests Charlie and Ellen on a longer holiday from the US. They used live on their own boat so it was a nostalgic return for them to life at sea. They were keen to sail Red Moon rather than motor so we did our best to oblige – though at times we had too much wind and had to batten down the hatches and enjoy the charms of Rona island instead! A long sail heading south east from Rona brought us to the entrance to Loch Carron and we had a little cruise there before heading across to Plockton for the night. On our final cruise back to Kyle we had a wonderful finale with a pod of lively dolphins to accompany us. With a day between we welcomed more guests from across the pond, this time a group of four, two of whom were experiencing their first time living onboard a boat! The family group wanted to end their cruise at Mallaig so that they could catch the Jacobite train as part of their grand Scottish Tour. We promised to deliver if we possibly could and for a while it was touch and go as to whether we could safely make it down the Sound of Sleat and into that busy fishing port. However, the weather co operated just enough for us to do just that and after an excursion Isleornsay, an explore of the drovers track on the side of Loch Hourn and a visit to the famous Old Forge pub in Loch Nevis we safely delivered them to the pontoon in Mallaig, with kind courtesy of the Harbourmaster. Before entering the Kylerhea and committing ourselves south, we had given the group a taste of the area north of the Skye Bridge with a cruise to Loch Carron and Plockton and a night at anchor in the Kishorn Islands. Red Moon made her way back to Kyle to get ready for her final cruise of the season for friends Beth and Dave, who have sailed with us before as part of the ‘Crinan Canal Crew’! With conditions rather challenging in Loch Alshe we met Beth and Dave at Dornie were they were able to leave their car. After a short cruise up Loch Duich we anchored in our favourite spot at Letterfearn and all went ashore for a walk. A friendly dog joined us for a while, enjoying having some new people to throw his chewy ball/ rag thing! On our return road journey and despite not having brought any one of the five pairs of binoculars we had on board, Dave managed to spot an otter swimming along the loch side! We followed it for some while before it disappeared, but it was a fabulous sight. As Beth and Dave are keen walkers, as are we, we decided to head for Loch Hourn the next day and while three of us got to walk the drovers track, Scott moved Red Moon back up the loch to meet us. This allowed for some great photos and even a little vid! We managed a trip ashore at Isleornsay where sadly Mary’s favourite shop Floraidh Skye was unusually shut! However there was a good exhibition on in the gallery and Beth and Dave came away with a wildlife bird picture. We returned to Loch Alshe with thoughts of spending the night at anchor in Loch Na Beiste but the wind was blowing up again and it was not the best place to be so we returned to Loch Duich and had a very peaceful afternoon at anchor, spotting the odd porpoise, looking at the birdlife and playing cards, with a wee dram or two by our sides. A lovely end to a great cruising season! The beginning of August seemed to usher in a change to the weather from the lovely long sunny days to a rather more mixed picture. Not that it stopped us getting out on the water and showing our overseas guests the beauty of the area in all its different guises. We took a family of mixed generations and nationality – Italian & Icelandic- out for four nights taking in Scalpay, Skye’s dramatic eastern coastline, Raasay & Rona before heading across to the Wester Ross coast and round into Plockton and Port Eorna. During the four days we saw so many amazing rainbows..
Whilst anchored in between Raasay and Fladda for the night we heard a PanPan call on the radio and after Scott had checked the position of the distressed yacht and realising we were the closest vessel, he advised the coastguard we could go to offer assistance. The yacht was being sailed solo and it had a line wrapped round its prop. With night coming on and unable to get himself to a safe location the skipper had put out the call. So between dinner courses we up anchored and motored a short distance to stand off Raasay’s north west coast within a short distance from the yacht. By the time we got there we could see the Portree lifeboat approaching and once the lifeboat was happy they had the yacht under tow they advised we could stand down and we returned to our anchorage … and pudding! We had a couple of short cruises to follow both of which took us north under the Skye Bridge and round to lovely Plockton, with a little excursion into Loch Carron’s narrows and the Kishorn Islands to see some seal action! On our second trip were were returning to Kyle when we saw the unmistakable splash of dolphins and we had our best sighting so far this year…check out our little video on YouTube..
Our next guests were on two week trip from Wisconsin to see more of Skye and her surrounding islands. They love Scotland and had visited many times but this time they were concentrating on this area and they joined us for six nights. The forecast was not the best but we were determined to make the best of it and try to ensure they did not miss out on seeing as much of our cruising area as possible. We started with a night in Loch Duich where they were able to compare a mural they have at home of Eilean Donan castle with the real thing! Next morning we set of down Kylerhea..the sea state was not the best in the Sound of Sleat but we sailed down to Isleornsay where our guests had a nice visit ashore taking in the Whisky Shop, complete with tastings, and then into Floraidh Skye and a quick look at an exhibition by Pam Carter whose fabulous colourful paintings of the area are a real joy to look at. After lunch we headed across to moody Loch Hourn and the weather cleared enough for our guests to have a short hike along the drovers trail before we took them onto the head of the Loch to a peaceful night anchorage, complete with deer spotting. We had a little porpoise sighting on our way out of the Loch the next day and having made the decision not to go any further south we nipped up Kylerhea early in the morning and stopped for tasty brunch at anchor in Loch Alshe. After an afternoon visit to Broadford we stopped for the night in the shelter of Scalpay, where the sun appeared, as did some strong wind gusts, heavy rain…and of course fabulous rainbows..
We had a brighter morning for a sail up Raasay Sound where we had a lovely dolphin sighting..followed by eagle spotting on the Portree cliffs and then a sail up the Sound with wind and waves behind us. We stopped at Churchton Bay on Raasay so that our guests could head to the Raasay Distillery for another whisky tasting session. That afternoon we headed into Rona’s sheltered anchorage where there was only one boat anchored…it had a Royal Navy white ensign on it and we joked about maybe one of the Royals was onboard…! A later google on the vessel suggested we might actually have been right.. This was also the day we had a rather good sighting of a submarine on manoeuvres.. Heading east from Rona we had a rather lively crossing to the Crowlins and then stopped for lunch in a new anchorage for us close to Plockton – very sheltered and calm. After a cruise into Loch Carron we decided not to anchor there but went to yet another new quiet anchorage just behind Ulluva Island just within sight of Plockton Harbour. Our guests had an enjoyable visit to Plockton the next day, walking above the village to a viewpoint, then stopping for a little gift shopping and a coffee at the Plockton Inn. They said their preference for their last night was a quiet and enclosed bay so we took them to one of our favourite hideaways – Poll Domhain. We took the tender for a little close ( not too close) encounter with the bay’s seal population before dropping them ashore for a walk over to one Wester Ross coast’s white sandy beaches. Finally that evening the wind dropped and the skies started to clear and it was a gorgeous last evening. Our sunny blue cruise back to Kyle the next morning was very busy with porpoise sighting – the most we have seen, all having a good feed and not really taking any notice of us! Just as we were approaching the Skye Bridge Mary was watching diving gannets when suddenly a rather large dark bird appeared in the sky – it was an eagle, no doubting it and she watched it for sometime as it flew on over the Crowlins and round over the Applecross hills. First time we have seen one in that area. Fabulous. North & South of the Bridge..
For our penultimate August trip we managed to give our guests a little taste of the areas both north and south of the iconic Skye bridge. We headed round to Plockton for a visit ashore but decided to anchor for the evening at the Kishorn Islands to give our guests that really panoramic evening viewing…. and we had some very dramatic views as the weather went from dark skies to sun lighting up the hills, rain and rainbows within the space of a very short time. Sailing across the Inner Sound and north about the Crowlins Islands we had a lovely little porpoise sighting before skirting the foot of Raasay where we had a pretty good eagle experience as two magnificent birds soared over the island. Our guests had an enjoyable tour and whisky tasting at Raasay Distillery followed by a walk in the hills. With a northerly wind getting a bit stronger we decided to anchor for the night in the southern part of the anchorage between Eilean Fladda and Raasay. They really loved the protected feel of the bay. We did a little detour north the next day to take a look at Rona and to try and eagle spot in Caol Rona before heading back down the west coast of Raasay with the dramatic view of the Skye coast to starboard. That day’s weather was a bit grim so we continued cruising right back under the Skye Bridge, through Loch Alsh and into Loch Duich. We stopped for a look at Eilean Donan Castle where there was fortuitously a pipe band playing, we think for wedding taking place. The weather cleared that evening allowing for a fine last sail back to the pontoons the next morning. Our final trip of the month had a been a while in the planning with specific requests for good weather, seals, porpoises, dolphins, whales and a sail at sunset time! Whilst our guest Rob knew he was asking for a lot and was very understanding that we might not be lucky with all or even any of that….well the stars must have been waiting to shine on him and his girlfriend Kathryn ( whose birthday surprise trip it was) as we managed the lot! Well we are not certain about the whale but all ( except the chef) saw something big breach off our beam as we sailed past the Crowlins and it wasn’t a dolphin!! We almost couldn’t believe the large, busy, but aloof, pod of porpoises, which were closely followed by a frisky bunch of dolphins who happily swam under Red Moons bow for quite some time. We took a little detour into Poll Domhain and switched both engines off to enjoy the utter silence and watch the curios seals who came pretty close by. After a tasty supper and a little glass of something sparkling for the lovely couple, we headed back to Kyle with a fabulous evening sky developing behind us. August 1st 2018 – our own Red Moon Day! This year we have been spoilt in Scotland with some wonderful warm and sunny weather. This allows for some truly relaxing cruising conditions and we have taken full advantage. On this four night cruise we picked up our guests, Jan & Rob, from Plockton where they had been staying the week before. With conditions looking good we headed south back under the Kyle Bridge, then down the Kylerhea to spend the first evening at Sandaig Bay. We had a fabulous cruise up Loch Hourn the next day stopping for lunch near the pool at the head of the Loch. As the tide was too low for Red Moon to enter the pool, Scott took the guests for a visit in the tender. We next headed into Loch Nevis and after a short visit ashore at Inverie we anchored for the night. Our guests were very happy just sitting back and admiring the scenery and taking every opportunity to get some great photos ( seen here! ), so we had a long morning cruise round the point of the Sleat Peninsula and into dramatic Loch Scavaig for our lunch stop where the seals were very co operative in posing for the camera! Our day ended in South Bay on the Small Isle of Eigg. The last full day of the cruise took us back up the Sound of Sleat with a lunch stop at Isleornsay and then a longer cruise up Kylerhea in ideal conditions, back under the Skye Bridge and settling for a fine evening in the Kishorn Islands. We dropped our guests back at Plockton the next morning. Mid June saw Red Moon involved in an exciting project to help make a film for the Outdoor Swimming Society. She acted as Mothership to the film crew and swimmers while anchored in Loch Hourn. Unfortunately timing was such that the crew arrived on the same day as Storm Hector! A quick switch to plan B meant that we moved Red Moon to the shelter of the Loch before the storm hit and they met us at Arnisdale where Red Moon was waiting. Four days of filming, swimming, drying out, eating and doing it all over again followed. We hope that Red Moon will feature strongly in the film which will be shown at various outdoor activity related festivals around the world. 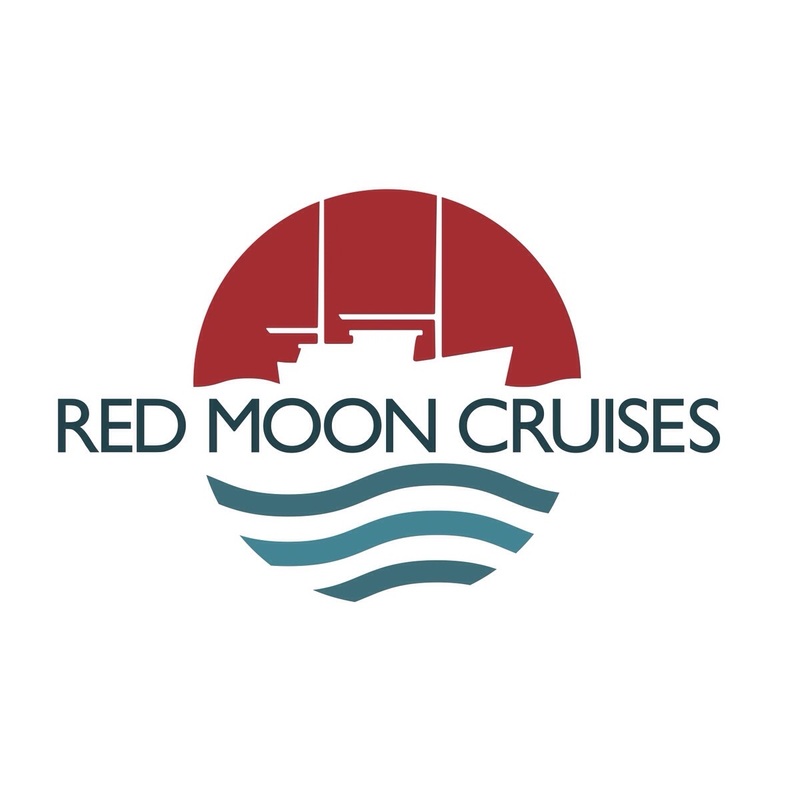 We also hope that this could be a new venture for Red Moon Cruises – we are able to get to many out of the way swimming locations which many people could not reach otherwise. As she comes equipped with hot showers, plenty of towels and drying space …and most importantly delicious homemade cake.. we think she would really appeal to the wild swimming community. We think it’s likely this cruise will prove to be the peak of the summer for us weatherwise and it gave us the chance to show our guests all the Small Isles – including Hyskeir lighthouse which we reached and explored on a very still, calm and hot day. The route we took was to head south straight to South Bay on Eigg after a first night stop at Sandaig. Our guests went ashore for a walk to the caves and enjoy the fabulous sunshine on this lovely island. We decided that there was time to get to the Isle of Muck for that nights stop. We had a lovely sail with a pod of porpoises and a very cute pufflet making an appearance. Muck was a new place for us and as we approached our anchorage in Gallanch Bay, one of our guests, Gez, was looking through binoculars and remarked that there seemed to be a lot of dogs on the beach…Mary immediately grabbed some more binoculars and to her delight saw that they were all Border Collies, her favourites, – and some were puppies! That evening we saw our best sunset of the summer so far – absolutely stunning! Our next stop the following day was Hyskeir. We floated for a while before entering the anchorage so that Gez could have a fishing opportunity in the deep water. When we anchored in what is usually just a temporary anchorage, due to the likelihood of swell, it was flat calm, hot and very still. The lighthouse loomed above us. We took the tender and went ashore to explore the grounds around what is now an automated lighthouse – as nearly all U.K. lighthouses are. Note: if you are a lighthouse fan have a read of “ Stargazing” by Peter Hill who was a young lighthousekeeper in the Seventies just before full automation. Hyskeir was one of the lights he helped to man. Canna was our next island but this time we anchored on the south side of the island in the appropriately named Canna Boat Harbour – again this often is not a suitable overnight anchorage but the conditions on this trip made it an idyllic spot. Finally the weather seemed warm enough for a swim…not sure that the water was really! While Gez chilled with a bit more fishing and Heather’s Dad John just relaxed on deck, Heather went ashore to explore this end of the island and get some sand between her toes! They all went ashore the next morning for further exploration while we took Red Moon around to Canna Harbour to meet up with them. Our return journey was via Loch Scresort on Rum for lunch and then we set sail to head back up the Sound of Sleat to spend the night at Isleornsay but this time anchored near Kinloch Lodge Hotel. After an early start we made our way into the mists of Kylerhea and Loch Alsh – suddenly we found ourselves in thick fog with our horn keeping any boats nearby aware of us. A most amazing fogbow formed in an arc over Red Moon’s bow. Anchoring in Loch Na Beiste we were suddenly in bright sunshine again for a hearty breakfast. Back across to Kyle and we were in the mist again to give an atmospheric end to an amazing cruise. By the time we had moored it was clearing just in time for some end of cruise photos! In between our longer cruises we had a couple of lovely short trips. The first was a repeat booking for us for Christine & Kevin who run their own B&B in the north of Skye. We had a lovely cruise to the Kishorn Islands where Kevin was very brave and went for a dip before settling down to a lovely dinner in the evening sun. The other was a gift from a daughter to her parents for their Ruby Wedding Anniversay and we were really pleased to welcome the happy couple David & Agnes plus David’s brother and his wife for a day cruise which took us out to the Kishorn Islands, the narrows of Loch Carron and Plockton before we headed back under the Skye Bridge. Our day cruises include morning coffee with Mary’s homemade shortbread, a lunch platter such as smoked salmon on brown bread, strawberries, something chocolatey and a glass of Prosecco. Afternoon tea with homemade cake finishes the day off very nicely! A group of four guests joined us for a night’s B&B on the Pontoons at Kyle before starting their cruise refreshed the next day. Before we had even started the cruise our guests had their first wildlife spotting – a fishing otter just between the Pontoons and the Skye Bridge ! It was also an evening for a fabulous sunset under the Bridge. This was a six night trip and that allowed us to show brothers David & Roger and their wives Jenny & Liz a bit of everything in this lovely cruising area. The first day of the cruise was David & Jenny’s Golden Wedding Anniversay and it started fittingly with a glass of bubbly with breakfast! Our cruise took us north from Kyle up the east coast of Skye where we were lucky enough to spot a couple of white tailed eagles, and onto Churchton Bay on Raasay just in time for David & Roger to make the final whisky tour of the day at the new Raasay Distillery. We anchored that evening just across the Sound of Raasay at Camus a Mhor Bheol. Rona was the next morning destination and we set the Genoa for the sail up the Sound. The wind grew stronger as we arrived so it was time to furl sails and anchor in the relative calm of Acairseid Mhor. Our guests went ashore for a walk up the hill to see the fabulous views over the Inner Sound. Leaving Rona we entered Caol Rona with the hope of seeing more eagles and heading down the east coast of Raasay but the waves had grown during our time at anchor and heading into them was just too uncomfortable so we headed back and sailed down the much calmer west coast and into the narrow northern anchorage between Eilean Fladday and Raasay. By the next day conditions had calmed so we were able to anchor for lunch on the south east side of Raasay just below a lovely waterfall. Our suggestion for that night was to head further east to one of our favourite spots – Poll Domhain. This met with approval and once settled the four were able to head ashore for a good walk on part of the Applecross coast. Our plan for the next part of the cruise was to head south and we were able to get down Kylerhea the next morning and stop for lunch at Eilean Rarsaidh near the entrance to Loch Hourn. We saw some seals as were were heading into the anchorage but then while we were having lunch on the aft deck, a fin was spotted! It was a mother and baby porpoise just cruising around and not seeming to mind us being there. It was very special. After an afternoon cruise through Loch Hourn we anchored on the opposite side of the Loch behind Eilean a Phiobaire for a peaceful evening and dinner on deck. The Small Isles was the next day’s destination and we cruised leisurely in good conditions towards Eigg. Eagle – eyed Scott suddenly spotted another fin but this time very excitingly, it was a Minke whale! We were able to hover around for sometime enjoying the spectacle of the whale who circled us, coming up very close to Red Moon. A precious moment for us all. A visit to Eigg followed with an explore ashore and then on our way to our nights anchorage on Muck we spotted a pod of dancing dolphins, who came towards us and obligingly played for a short while in Red Moon’s bow wave. Friendly seals in Gallanach Bay plus many seabirds, completed our fabulous wildlife spotting of the day…the next day there was more to come with puffins seen while on our way to Rum for a very early breakfast. We stopped in Loch Scavaig and armed with a picnic our guests went ashore to explore Loch Coruisk and the Cuillins on what turned out to be a really lovely sunny day. The trip concluded with a run up to Isleornsay before an early start to get up Kylerhea with the tide and breakfast in Loch Alsh. However even our final run on the south coast produced more fabulous wildlife sightings … this time a basking shark! Alltogther it was a very awesome wildlife cruise which took in many highlights of this beautiful area….a bit of everything in fact. We had a two night cruise next and the weather, whilst not as good as it had been, allowed us to go south and explore both Loch Hourn and Loch Nevis. We were able to sail into the pool at the head of Loch Hourn and then rather than head across the Sound of Sleat to Isleornsay we thought we would go further south and visit Loch Nevis. At twilight whilst at anchor in Loch Nevis we had a fantastic otter sighting. It was a mother and two cubs who were playing in the water not too far from the boat. Wonderful! We left Loch Nevis on the final morning in rather heavy mist and a slightly lumpy sea but once we got further up the Sound of Sleat and the seas was behind Red Moon she moved comfortably forward into a clearer day.